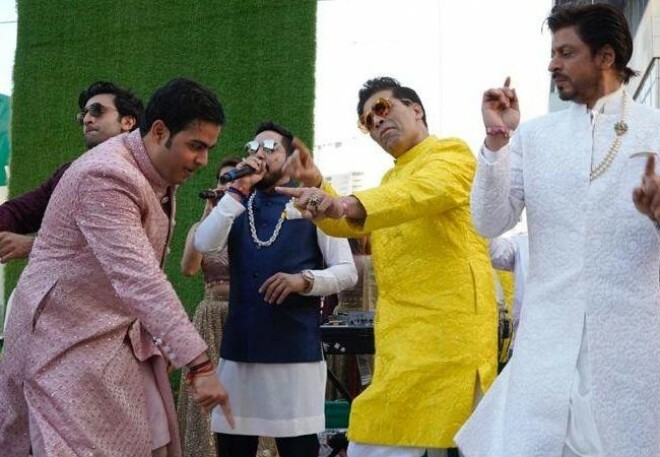 Mumbai, March 10: Bollywood big celebrities like Shah Rukh Khan, Ranbir Kapoor and Karan Johar danced away to singer Mika Singh's live tracks as industrialist Mukesh Ambani's son Akash Ambani made his way to wed Shloka Mehta here on March 9. Coming to more details, The celebs, including Priyanka Chopra and director Ayan Mukerji, joined the lively and colorful 'baraat,' which also saw the groom's parents – Mukesh and Nita Ambani – as well as sister Isha Ambani groove. While Isha sported a pastel pink lehenga, Nita Ambani was dressed in a heavily-embroidered lehenga. The groom looked dapper in a soft pink, intricately embroidered and sequinned sherwani, and seemed to be enjoying the wedding procession to the hilt. The wedding venue – the Jio World Centre, Bandra-Kurla Complex here – was decked up with elaborate floral arrangements set according to a garden theme complete with a faux waterfall, floral figurines, a fountain and a grand stage with a huge Krishna idol done up in flowers. Live music added to the festivities at the wedding gala, which saw the Who's Who of the cinema, political, business and sports world.